Chairman Kelvin Thomas has been outlining his and the board of directors’ reasons for sacking Dean Austin just 12 matches into the manager’s reign at the PTS Academy Stadium. Austin was relieved of his duties by Thomas on Sunday evening, just a day after Town’s 4-0 loss at Mansfield, a result the chairman described as being ‘embarrassing and unacceptable’. Thomas thanked Austin for his efforts in the role, and felt initially he had a positive impact having taken over from Jimmy Floyd Hasselbaink, who was sacked in April. 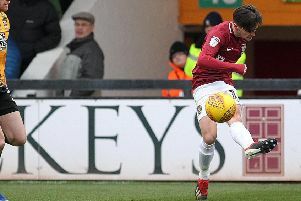 But a serious downturn in performances over the past three weeks, culminating in the thrashing at Mansfield, left the Cobblers only two points above the Sky Bet League Two relegation zone and Thomas in no doubt that a change was required to stop the slide towards possible relegation. The chairman insisted that he still felt it was the right decision to give Austin the job in May, that the 48-year-old ‘deserved his chance’, and he was willing him to succeed. But, sadly, things have not worked out. Austin becomes the fourth Cobblers boss to lose his job in the space of just 20 months, the third in a little more than a year, and he goes having won just one game of his dozen in charge after being handed the reigns following a five-game caretaker stint last season. That victory came at Colchester United last month, but Town failed to win any of their home fixtures this season and on Saturday slipped to 21st in the league two table, above only Macclesfield, Grimsby Town and Notts County. The early season optimism and hope following a string of encouraging performances has quickly evaporated, and the battering at the hands of the Stags was the last straw. Asked about how the decision to part company with Austin came about, Thomas said: “We pretty much decided on Sunday. “Dean has done great for us in terms of that he has been very professional and he has worked incredibly hard. “He came in at the end of last season and he changed things around, and I think he deserved a chance. “It was a gamble, I think it was always going to be a gamble because of his lack of experience as a manager, which we have always felt was important. “But Dean deserved his chance and we gave it to him, but we had to look at the overall picture, and our concerns for the season and the performances. Thomas was then asked if Austin’s future had been spoken about ahead of the loss to Mansfield, and he said: “There have been discussions, and obviously Saturday didn’t help because it was a poor performance. “It was an embarrassing performance, and Dean said that afterwards himself. “It’s not as if Dean looked at it and said ‘that was okay’, it wasn’t acceptable. “I am going to the training ground, and I will talk to the players, talk about the decision and about what our expectations are and the disappointment we have. “We will share the anger we feel, and you look at the 500 Northampton fans going up to Mansfield on Saturday and witnessing that, and your heart goes out to them. “We had to make a decision, as results and points wise, we haven’t done what we expected to do, and we have a big budget for this league. Austin let a lot of his frustration pour out in an extraordinary post-match interview following the loss to Mansfield on Saturday. The former Watford assistant boss was very emotional and upset as he made it clear he felt the players had let him and the club down. So did that post-match interview have any bearing on the decision to sack the manager? “Oh no,” said Thomas. “Dean was angry, and it is always difficult when you have to respond and you are angry, but he was right. “He said no different to what we were all thinking, and I am sure half of the players thought that as well, it was totally unacceptable. Thomas is clearly not happy with the squad’s performance levels, and he says the players now have to stand up and take some responsibility. “The players have to take a long, hard look at themselves,” said the chairman. “We have to be concerned about our league position, there’s no two ways about that, and the players are a main part of that. “I talk to fans a lot, and the first few comments I got from fans on Facebook (following the news of Austin’s sacking) were about the players, and I even had one that said ‘I hope the players can sleep tonight’. “Everybody is disappointed for Dean. “It’s not all about the players, we take collective responsibility, I take responsibility, we all take responsibility at this football club. “That is what I will be talking to the players about, and their responsibility because it is important.